From the Jackson Clarion-Ledger to the New Yorker, to Mother Jones, to the Nation, to the National Review and the New York Times, everybody’s talking about Curtis Flowers. All the ruckus results from In the Dark, an APM podcast that recently devoted eleven groundbreaking, hour-long episodes to the flawed prosecution of the Flowers case. When I first got interested in this case ten years ago, the consensus in mainstream Mississippi was that the state’s case against Curtis was rock solid. Sure, the prosecutor had made a few dumb moves that lost him a couple of convictions, but so many witnesses placed the accused near the scene of the crime that few questioned the substance of the state’s case. Sure, Evans tried to get an all-white jury. What prosecutor in a case featuring high-profile white folks and a low-status black defendant, doesn’t try to pack the jury with white folks. Evans just made it a little too obvious, that’s all. I have long known that my investigations, by themselves, are sometimes taken with a grain of salt (even though I am always right). I am neither an attorney nor a journalist; I am an unabashed advocate with a PhD in church history and theology. So, what do I know? In most of the cases Friends of Justice has tackled, therefore, it has been necessary to attract top flight legal power AND dedicated investigative journalism before serious wrongs can be righted. Even then, it can be risky for these late-to-the-party champions to acknowledge that they are in any way indebted to my analysis of the case. Nearly all the symbolic themes–hate crimes, Jim Crow justice, rogue prosecution, and the ghosts of the Old South that were supposed to be alive and well in Jena–that attached themselves to the Jena Six case as the months rolled by can be traced to the work of a single man: Alan Bean, a white American Baptist minister who operates an organization called the Friends of Justice in Arlington, Texas. There is little chance of that happening in the Flowers case. Although the In the Dark team often reproduced the arc of my narrative (this was especially true of the episode dedicated to the background of prosecutor Doug Evans) they scrupulously avoided references to outside influences of any kind. This bothered me at first, but I eventually adjusted my expectations. I doubt In the Dark would have embraced the Curtis Flowers story if my blogging and post-trial legal arguments hadn’t exposed the weakness of the prosecution’s case. But they have taken the investigation of this case to a whole new level. I have probably visited Winona a dozen times over the years, and the attorneys associated with the Flowers legal fight have dropped by from time to time. The In the Dark team camped out in Mississippi for a full year. When you talk to the same person five or six times over the course of twelve months they begin to open up to you. You are viewed as a friend, not an impostor from the outside who will be gone in a day or two. Moreover, the In the Dark team was willing to invest hundreds of tedious hours re-interviewing reluctant witnesses, sorting through trial transcripts, court records and prison disciplinary reports. Again and again, this hard work produced stunning results. The biggest scoop was getting Odell (Cookie) Hallmon, a jailhouse snitch who has testified that Curtis Flowers confessed to the crime, to admit on tape that his story was a complete fabrication. The fact that Cookie dropped this casual admission on a contraband phone while incarcerated in Parchman prison (the same place Curtis Flowers is locked up) added a touch of poignant perversity to the story. But In the Dark didn’t just destroy the credibility of a key witness, they also demonstrated that, over the years, Doug Evans has repeatedly handed Cookie Hallmon a get-out-of-jail-free card in exchange for his perjured testimony. When this self-confessed career criminal should have been locked up, he was on the streets dealing drugs and assaulting police officers. The coup de grace came when, free due to yet another favor from Doug Evans, Hallmon murdered three people (including his girlfriend and her mother) over a petty spat. Weeks later, he was reaching out to family members of his victims asking for money and friending them on Facebook. And then there is Jeffrey Armstrong, the man who says his dog retrieved a rusted .380 automatic pistol from the crawl space under his mother’s rental home in Winona. The home is located about a block from the Tardy furniture store where four innocent people were murdered, execution style, with a bullet to the back of the head in July, 1996. Ballistics evidence suggests that the gun used in that robbery was (you guessed right) a .380 automatic. I had heard this story from Lola Flowers, Curtis’s mother, but had never attached much significance to it. Nor had anyone else. The Starz network featured the Flowers case in its Wrong Man series while the In the Dark episodes were still dropping. Wrong Man employed a reality TV format in which half a dozen criminal justice experts were flown to Winona and asked to re-investigate the Flowers case. Two detectives interviewed Jeffrey Armstrong, talked to a police officer who claims he never received the weapon (as Armstrong claims) and dismissed the story as a fabrication. They could tell Armstrong was lying just by by reading his demeanor, or so they imagined. Wrong Man was also many months in production. In fact, the segments featuring my comments were filmed about the same time Madeleine Baran and Samara Freemark of In the Dark flew to Arlington to interview me. But the Curtis Flowers case was only one of three wrongful prosecutions the Wrong Man series was looking at and, compared to In the Dark, guess work and hunches often substitutes for hard-won facts. But that’s true of real-life investigations as well, so Wrong Man may have given us more reality than they realized. Most of the witnesses and police officers interviewed by Wrong Man either refused to talk or fed investigators outright lies. Wrong Man effectively captured the pervasive sense of fear, even dread, that hangs over Winona and their visuals give the viewer a good feel for the town. In one scene, Johnny Hargrove, the black police officer who was a first responder back in 1996, threatens the Wrong Man team with legal action if they don’t get the hell off his property. What’s he hiding. Wrong Man asks questions; In the Dark offers answers gained through sweat and, I suspect, a few tears. The journalists associated with In the Dark never guess or speculate. Instead of guessing whether the story about the dog and the rusted .380 was credible, they talked to every Winona police officer they could find. Eventually, a second officer verified Armstrong’s account, insisting that the gun Armstrong turned in had been handed over to prosecutor Doug Evans. When In the Dark called the state crime lab they learned that Evans had never submitted the weapon for testing. The In the Dark team also discovered, after sifting through a stack of court records half a mile high, that, over the course of his 30 year career as District Attorney, Doug Evans has used peremptory strikes on black people 4.5 times as often as he has used strikes on white people during voir dire, the jury selection process. That’s not speculation; it’s a documented fact. Finally, the In the Dark team tracked down Willie James Hemphill, a mystery man whose name had been mentioned in passing in the discovery materials Doug Evans turned over to defense counsel. After retracing a long series of missteps and dead ends, the team managed to locate Mr. Hemphill in an Indianapolis courtroom where he was awaiting arraignment. Hemphill told Madeleine Baran and Samara Freemark that, in the days following the Tardy murders, he had been the target of a massive manhunt. Fearing that he would be shot on sight, he eventually turned himself in to the Winona police and spent eleven days in custody. State witnesses had testified in the sixth Curtis Flowers trial that they spent less than five minutes talking to Hemphill and immediately ruled him out as a suspect. Hemphill says that local authorities told him they had several witnesses willing to testify that they had seen him near the Tardy furniture store on the morning of the murders, and pressured him to confess (it’s legal for investigators to lie, by the way). None of this information was made available to defense counsel. That said, the In the Dark podcast omitted some pretty important information. My deep gratitude for this amazing piece of journalism makes it hard for me to offer a critique, but a few issues simply must be addressed. I have no beef with anything they reported (in fact, I stand in awe of their unprecedented achievement); but a few things were omitted and I’m still not sure why. I have attached great significance to the fact that, shortly after the sixth Flowers trial, Patricia Hallmon (Cookie Hallmon’s sister), was convicted on numerous charges of income tax fraud and was sentenced to three years in federal prison. Despite the fact that Patricia Hallmon’s conviction for a crime of dishonesty has received slight attention in the media, it is a damning development. In my view, Patricia Hallmon’s testimony was far more important to the state’s case than the Curtis-told-me-he-did-it testimony of her brother. Cookie was brought in at the end of trial as the icing on a cake that had already been baked. At the conclusion of Trial 6 (which a team from Friends of Justice attended from start to finish) Cookie testified that he was dying from AIDS and wanted to get things right with his Maker while he remained in the land of the living. In a Bible Belt town, that was powerful stuff indeed. But Patricia Hallmon’s testimony was the glue holding the state’s case together. Numerous witnesses claimed to have seen Curtis Flowers walking to the Angelica garment factory, back to his home, then to the Tardy furniture store, and finally home once more. This timeline was handed to the prosecution by Patricia Hallmon. She told investigators that she saw Curtis leave the duplex apartment next to hers and return once again at precisely the times investigators would have suspected. (It is likely, in fact, that John Johnson handed Patricia the timeline and simply asked her for corroboration. Either way, her testimony gave the impression that the state’s case was a jigsaw puzzle in which all the piece fit perfectly. In the Dark also neglected to tell listeners that Patricia Hallmon was prosecuted in federal court by an attorney who, on several occasions, helped Doug Evans prosecute the Flowers case. Evans failed to inform defense counsel that his star witness had been indicted prior to the most recent Flowers trial, another serious Brady violation. Evans says his former associate failed to inform him of the indictment, but, as defense counsel has argued, that is patently impossible. There is no way that investigators as thorough as the In the Dark team didn’t know about Patricia Hallmon’s backstory. They likely decided that their story would be more compelling without the information about Patricia. Or perhaps they just didn’t have time to work it in. They aired a good interview with Patricia in which she came close to saying that she believes Curtis is innocent. This advanced the story considerably, but the larger context was ignored. In the Dark may have played down Patricia’s importance to the prosecution’s case because her brother’s recantation is much more dramatic if he appears as Doug Evans’ star witness (a distinction that, in my view, should go to Patricia). True, Cookie offered the only “direct evidence” in the Flowers case, but Patricia tied the state’s case together. Whatever the reasoning behind it, this omission surprised and disappointed me. The second huge omission relates to what I call the “Birmingham Boys” connection. Succinctly stated, Marcus Presley and some of his friends, went on a crime spree just before and after the Tardy murders in Winona in which Presley shot the victims (on two occasions, fatally) while his associates held their weapons on the victims co-workers. Video of one of these crimes shows Presley’s .380 automatic jamming just as the gun used in the Tardy murders jammed. Moreover, in a sworn affidavit, Presley stated that a few of his brothers in arms were in Mississippi the week of the Winona murders and reported having pulling off a couple of heists. In his feature length piece in the Jackson Clarion-Ledger, Jerry Mitchell gives considerable attention to this aspect of the story and I have blogged on it repeatedly (most recently, here.) The Wrong Man episodes dedicated to the Flowers story also gives considerable attention to the Birmingham connection, but In the Dark does not. If I had to guess who killed Bertha Tardy, Carmen Rigby, Robert Golden and Derrick (Bobo) Stewart in 1996 I would go with Marcus Presley. Although he was only 16 years-old at the time, Presley had already murdered two victims in cold blood that summer and he was the only person involved in any of the Birmingham crimes to discharge his weapon. If anyone from Birmingham was involved in the Tardy murders, Presley was in the thick of it. Cold-blooded mass murders are extremely rare in small towns like Winona because most people, even if they have a history of violence, are incapable of remorselessly, even casually, dispatching a helpless victim. In the Dark chose to ignore Marcus Presley and the Birmingham Boys, even though they do acknowledge that a mugshot of Presley showed up in the photo array shown to one of the witnesses in the Flowers case. That witness was Pork Collins. He claims that, while driving by Tardy Furniture on the morning of the murders, he witnessed two African American males arguing vociferously within thirty feet of the crime scene. One man had a foot planted inside a dust-covered car, the other was standing near the hood of the vehicle. Much is made of the ways investigator botched the photo array, arranging things to that Collins was almost certain to identify Curtis Flowers. But what if Porky Collins witnessed two of the Birmingham Boys just before, or just after, the crime was committed? Just because Porky couldn’t credibly identify a specific suspect didn’t mean he created his testimony out of nothing. The In the Dark team may have decided to downplay the Birmingham connection because they already had an alternative suspect: Willie James Hemphill. They aren’t saying Hemphill did the crime; the argument is that Hemphill was a far more credible suspect than Curtis Flowers. Hemphill lived very near the house where the rusty .380 pistol was recovered and, most significantly, Doug Evans kept defense counsel from knowing that Hemphill had been a serious suspect in the Tardy killings. But Willie James Hemphill doesn’t make a very compelling suspect. Sure, he has some domestic violence on his rap sheet, but nothing in his extensive history of petty crime suggests that he is capable of shooting four helpless people in the back of the head just for the hell of it. Moreover, Hemphill had no discernible motive for the crime. Marcus Presley, on the other hand, didn’t need a motive. He had already shown a growing lust for gratuitous violence and a willingness to pull the trigger without a hint of remorse. Presley also has the kind of nightmarish childhood that is often associated with a sadistic streak. I’m not saying Presley pulled the trigger. Unless someone confesses, we may never know who did the crime. But, of all the options currently on the table, Presley is as good a bet as any and In the Dark should have acknowledged that fact. Could Doug Evans get a seventh guilty verdict from a Winona jury if this case ever returns to the courtroom? No, he could not. His two star witnesses, Patricia and Cookie Hallmon, will never again grace the inside of a witness box. They are, to put it very mildly, damaged goods. Secondly, it is now common knowledge that Doug Evans intentionally prevented defense counsel from developing alternative theories of the crime. Third, whether you go with the Hemphill theogy or the Presley theory, Doyle Simpson’s gun had nothing to do with the crime. I still don’t know why Doyle announced to the world that his .380 had been stolen that fateful morning; but it no longer matters. Any .380 could have been used. If the murder weapon was the rusted .380 Mr. Armstrong found the link to Doyle Simpson is greatly weakened. If Presley was the shooter, he would have used his own .380. In the Dark has made such a shambles of Doug Evans’ reputation that he will never be able to try Curtis Flowers again. On the other hand, in the era of Trump, no white politician in Mississippi is likely to stand up for Curtis Flowers. So it could be years before Curtis Flowers walks free, but that day will come. But Lola wanted me to know that she was thrilled with In the Dark. Now the whole world knew that her son is innocent. Lola was looking forward to better days. Then we got the news that Miss Lola had died in the hospital. 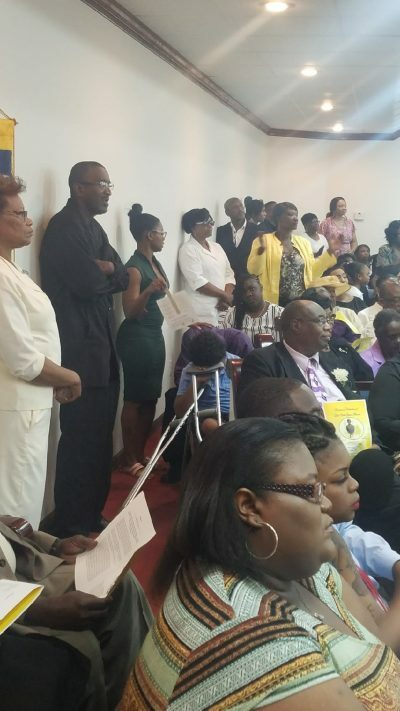 It was standing room only at the memorial service for Lola Flowers. Archie Flowers and the rest of the family have been surrounded by love and support. Everybody has been listening to In the Dark and the fear that once stalked Winona’s black neighborhoods is beginning to lose its grip. People are mad as hell; and they won’t take it anymore. Not from Doug Evans. Not from nobody. In the Dark will continue to publish the occasional update on the Flowers case with their accustomed depth and rigor, but the team will soon be looking for a fitting subject for season three. And, as Madeleine Baran will tell you, they don’t do advocacy journalism. The goal was never to prove that Curtis Flowers is innocent; the focus was on the flawed investigation and corrupt prosecution sponsored by Mr. Doug Evans. Whether this DA survives the next election depends largely upon the white electorate. I’m guessing he will win re-election quite handily (especially if no one steps up to challenge him) but I have been wrong before. It’s good to know you’re still on the job.